The rivalry between England and Australia started on 9 January in 1909 at Blackheath's Rectory Field in England. The Wallabies won the match 9 points to 3. The two nations next met in 1928, at Twickenham, and England won 18 points to 11. Twenty years passed before England and Australia met again, at Twickenham, in 1948, with Australia winning the affair 11 points to nil. It would then be another decade until the two nations played another test against one another. In 1958, they met again at Twickenham, and England won by nine points to six. England and Australia played each other twice during the 1960s, first in 1963, when the Wallabies defeated England 18 points to 9 at Sydney's Sports Ground. They met again in 1967 and England went down again 11 to 23 at Twickenham. The nations played each other another four times during the 1970s; with England winning 20 points to 3 at Twickenham in 1973, Australia winning 16 to 9 at the Sydney Cricket Ground in 1975 and again that year 30 to 21 at Ballymore, and England winning in 1976, 23 to 6 at Twickenham. The two nations would meet six times during the 1980s, the first encounter was in 1982, with England defeating Australia 15 to 11 at Twickenham. Two years later the Wallabies were victorious at Twickenham, winning by 19 points to 3. The next match was a pool match in the 1987 Rugby World Cup at Sydney's Concord Oval in 1987, with Australia winning 19 to 6. The nations played again in 1988, this time three times; Australia winning 22 to 16 at Ballymore, and again, 28 to 8 at Concord Oval, with the third and final match being played at Twickenham which England won 28 points to 19. The sides met three times during the 1990s before the Cook Cup was introduced. The first match was in 1991 at the Sydney Football Stadium, and Australia won by 40 points to 15. The next match was the 1991 Rugby World Cup Final at Twickenham, which the Wallabies won by 12 points to 6. The last pre-Cook Cup match was a Quarter-Final of the 1995 Rugby World Cup in South Africa, and was played at Newlands Stadium in Cape Town. England won by 25 points to 22, with a drop-goal in the dying seconds of the match. The Cook Cup came about when the Rugby Football Union (RFU) and the Australian Rugby Union (ARU) agreed to play each other on a home-and-away basis. The first Cook Cup match was played at Sydney's Aussie Stadium on 25 June 1997. Australia won the match by 25 points to 6. The series was however to be decided through two tests, and the second took place at Twickenham in London, this resulted in a 15-all draw. Since Australia won the first test, they were crowned champions. In 1998 Australia ran out 76 to nil winners at Lang Park in Brisbane. The Wallabies were captained by John Eales, and in total, Australia scored 11 tries. The subsequent meeting at Twickenham saw England lose by just one point, the score being 12 to 11. The following year, the Cook Cup was decided through one match as opposed to the two Tests. The reason for the format change was due to the 1999 Rugby World Cup. Australia defeated England 22 points to 15 at Stadium Australia. The following year, the Cook Cup was again contested over the single match, due to the 2001 British Lions tour to Australia. The match was played at Twickenham, and England won 22 to 19 to win their first Cook Cup. The single-test format remained for 2002, and England successfully defended their Cook Cup by beating Australia by just one point, 32 to 31 at Twickenham. For 2003, the Cook Cup was again decided over one match, due to the 2003 Rugby World Cup. 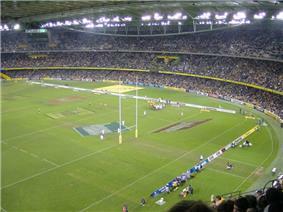 The match was played at Melbourne's Telstra Dome, and England won 25 to 14. Also that year, the two nations met in what is arguably one of their most famous encounters ever, at the World Cup final. Jonny Wilkinson landed a drop goal in extra time that saw England win the Rugby World Cup by 20 points to 17. The first post-World Cup match between England and Australia was played at Brisbane's Suncorp Stadium, in 2004, which saw Australia win 51 to 15. The 2004 Cook Cup was contested over two matches and the second game was played at Twickenham, with Australia winning by 21 points to 19, which saw the Wallabies win the Cook Cup. The 2005 Cook Cup was decided by just the one test, and England won by 26 points to 16 at Twickenham. In 2006 both games were won by Australia. Since 1909, England and Australia have played each other 44 times. England have won 18, Australia 25 with 1 draw as of 3 October 2015.